Samsung announced the Galaxy Note 9 today at its Unpacked event in Brooklyn, New York. 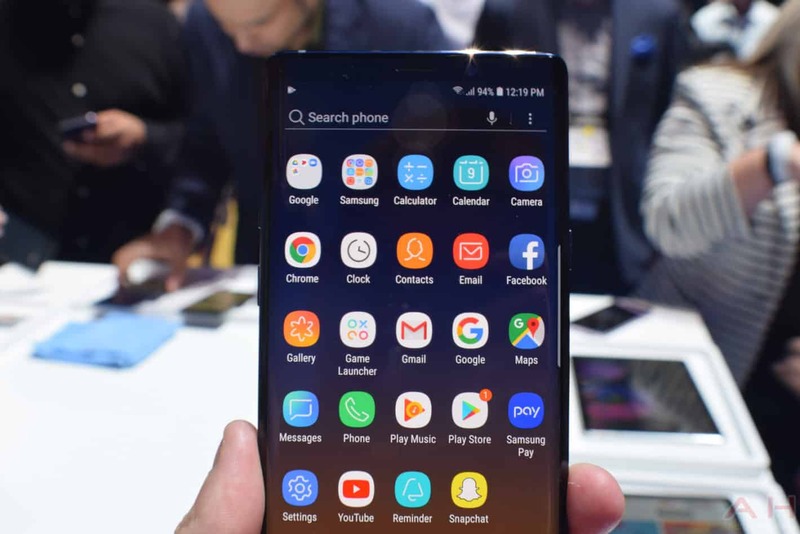 The Galaxy Note 9, for the most part, lives up to the many leaks that surfaced ahead of the official announcement. But it is still shaping up to be a pretty impressive device from many aspects. Particularly the S Pen. This year, Samsung made more changes to the S Pen then it has ever before. Not only has it changed up the paint job on the S Pen, but it has made it, essentially, a remote control for the Galaxy Note 9. We’ve spent some time – albeit brief – with the Galaxy Note 9, and have some thoughts, so let’s talk about Samsung’s latest Big Thing. The Galaxy Note 9 does look a whole lot like the Galaxy Note 8, and that’s not a surprise at all. Samsung, like the majority of the smartphone world, doesn’t change up its smartphone design every single year. So seeing the similarities here is not a surprise. But you do get a slightly larger display here, at 6.4-inches. Though the overall size of the Galaxy Note 9 is the same as the Galaxy Note 8. That means that the bezels are just a tad bit thinner this year. Under-the-hood, you’re getting all of the hardware you’d expect in a phone that costs $999. And that includes the Snapdragon 845 chipset, 6GB of RAM and comes with 128GB of storage as the base model. That’s definitely a good look for 2018, and shows that this is going to be a future-proof smartphone for a few years. Samsung also packed in a 4000mAh capacity battery, so it’ll last you all-day and then some. At least that is what Samsung is hoping here. 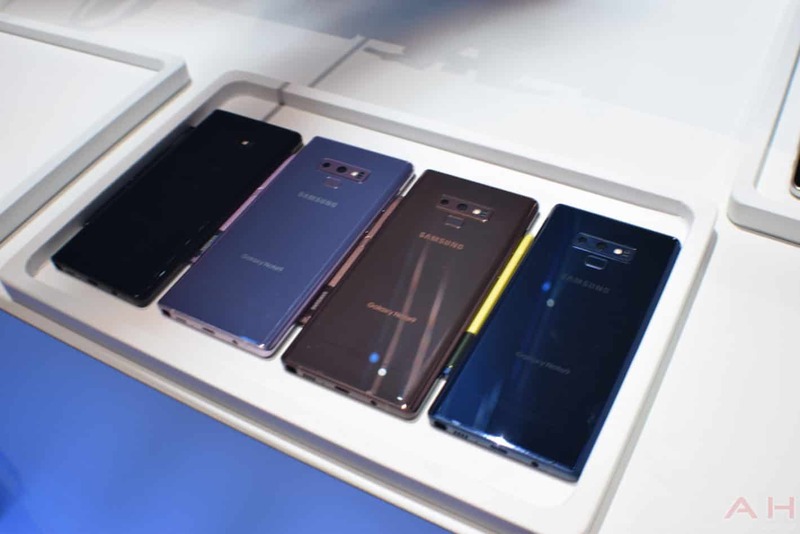 Samsung has brought out some new colors for the Galaxy Note 9 this year, and it’s a pretty bold color palette. In the US, there’s the Ocean Blue and Lavender Purple, while internationally, the Midnight Black and Metallic Copper are also available. The Lavender Purple is a really good color here, while the Ocean Blue is a bit darker than the “blue” colors that Samsung has used on other smartphones. The Ocean Blue also gets a Yellow S Pen while the others match the phone’s color. The rest of the design here is not too flashy, but it gets the job done – and yes Samsung kept the headphone jack. The biggest change, as already mentioned, is actually in the S Pen. On the surface, it’s the same S Pen as before, but Samsung has included Bluetooth connectivity this time around. This allows you to use the S Pen as a remote and do different things throughout the OS. 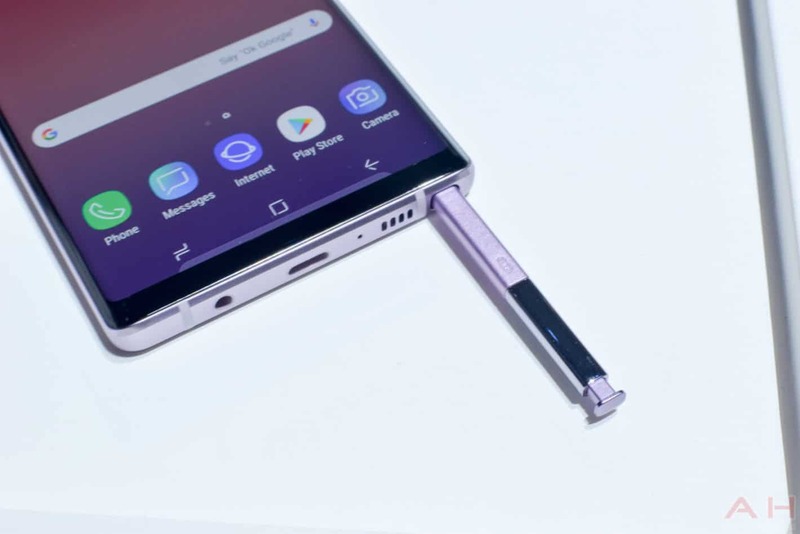 One of the biggest features that Samsung is showing off is the fact that you can long-press the button on the S Pen to open the camera, and then press it to take a photo. You can switch from the back to the front camera (and vice versa) by double-clicking the button as well. This means that you can get selfies without holding your phone nearby, giving you a really great shot. Now the S Pen is able to do this in other apps too. Like the gallery. You can press once to go forward, or double-tap to go back. Speaking of pictures, the Galaxy Note 9’s camera is supposedly “all-new” this year. Now we did check out the camera on the Galaxy Note 9 here in Brooklyn, but this was in a controlled environment – and likely on unfinished software. So we’ll have to take that with a grain of salt, but it did a really great job. The camera can also adjust the aperture automatically, depending on the situation, which is a step above the variable aperture that Samsung showed off on the Galaxy S9 Plus earlier this year. This is going to allow those that aren’t professional photographers to get some great shots as well. Finally, the software. It’s still Samsung Experience and unsurprisingly, it is running on Android Oreo. This isn’t surprising, given the fact that Android Pie only went stable on Monday, so most new smartphones are still going to be sporting Android Oreo for the next few months. But the software has all of the great Samsung apps you’d expect, including the Screen-Off Memo, which now uses the same color as your phone. So if you have the Ocean Blue Galaxy Note 9, it’ll be shown in “Ocean Blue” on your Galaxy Note 9. It’s a small thing, but it looks really nice. Samsung announced that pre-orders start tonight at midnight EDT, and the Galaxy Note 9 will go on sale on August 24. The Galaxy Note 9 will start out with 128GB of storage at $999, and for those that need more storage, there is a 512GB model available for $1249. In the UK, the prices are similar, at £899 and £1199 respectively.